Introduce fashionable florals into your morning with the Casa Domani Carlotta Mug Set of 4 350ml Gift Boxed. 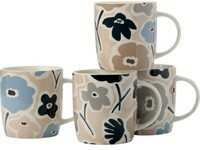 This 350ml set comes in warm, earthy shades with splashes of blue in an illustrated floral design. Made from quality porcelain the set is durable, chip resistant and have a quality looking finish. For convenience, the Casa Domani Carlotta Mug Set of 4 350ml Gift Boxed are dishwasher and microwave friendly so they can withstand everyday use. The set is packaged in a coordinated gift box making them ideal for housewarming and engagement gifts.